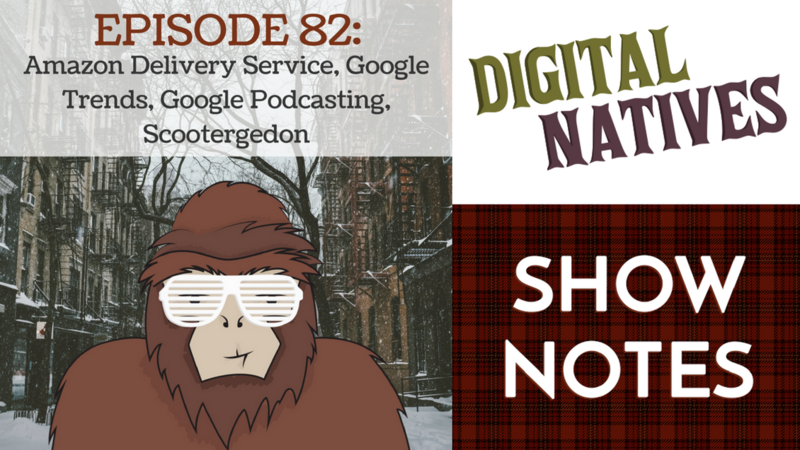 This week on the Digital Natives Cast, Kyle, Mitch, Min, and Rudy are talking about new innovations in Amazon delivery services, as well as a great tool called Google Trends that helps you stay on top of your digital media! We also discuss the scootergedon in San Francisco. Check in with the Digital Natives every Friday for the latest news in the world of technology, marketing, and design! The last stretch to delivering your package is always a hassle. Either you aren’t home and can’t sign for it or its left on your front porch for anyone and everyone to see. Amazon has been working on combating this problem with new and improved ways of delivery. Digital marketing has a plethora of tools to help with your strategy and quality of marketing. Google Trends is a tool that can be used to look at search market share you have versus your competitors. Google has added features to make Podcasting more discoverable and easier to listen to. Its called Discover and Listen and it displays the top three podcasts on the search page. It will be alongside the web, video and image results. San Francisco is in the midst of a ‘scootergedon.’ A few companies are renting out electric scooters for the last mile of people’s journeys. The problem is people are getting injured from speeding scooters on the sidewalk, and by the mere number of scooters left in random sidewalks and dumpsters.